Texon, West Texas Ghost Oil Town with Santa Rita No.1. Texon is located about 3 /10 mile south of Hwy 67 on FM 1657. Here you'll see a derrick and the well-preserved remains of Santa Rita #1, the well that brought in the huge Big Lake Oilfield. Historical marker provides details. 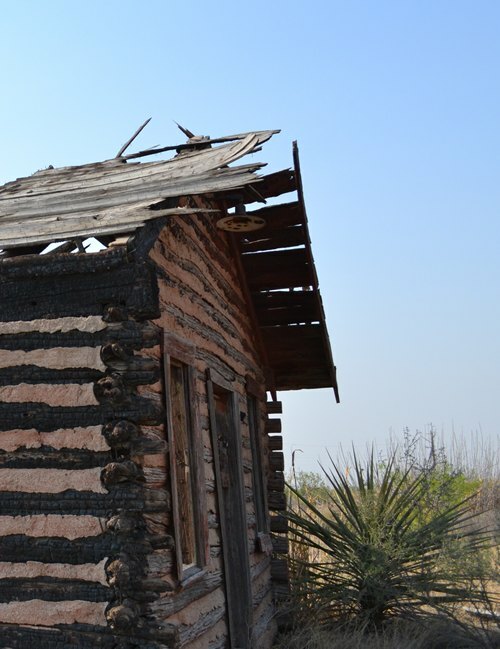 There are two "ghost towns" in Reagan County. Texon has the greater population. The other is Stiles, with only the ruins of the torched former courthouse (Christmas Eve 1999). Texon was a planned community that at one time had a population of over 1000. The Big Lake Oil Company was sole owner of the property. Sidewalks, street signs and mailboxes with two or three wooden structures are all that remain. Two homes appear to be occupied and strangely enough, as if anticipating a rebirth, the street signs are new reflective ones, in some cases standing alongside the old wooden ones that they're replacing. The postal service has also installed a new mailbox looking out of place among the five-foot tall weeds. It's obvious that there is recent activity with the wells. Hoses and wires follow the grid of the former yards where deer and jackrabbits now graze undisturbed and unfrightened by visitors. The abundance of these creatures along with roadrunners, makes Texon a good spot for observing wildlife. 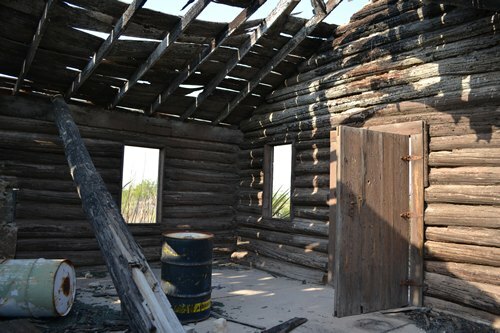 Texon is one of the featured ghost towns in T. Lindsay Baker's Ghost Towns of Texas. 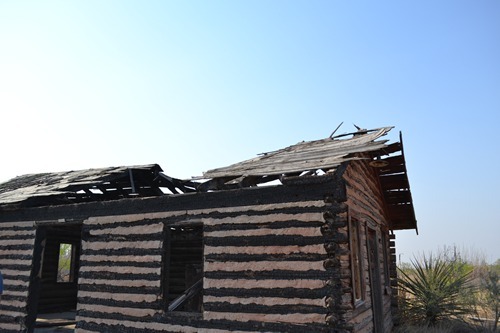 Early travelers along many historic trails in this area found the region arid and inhospitable. 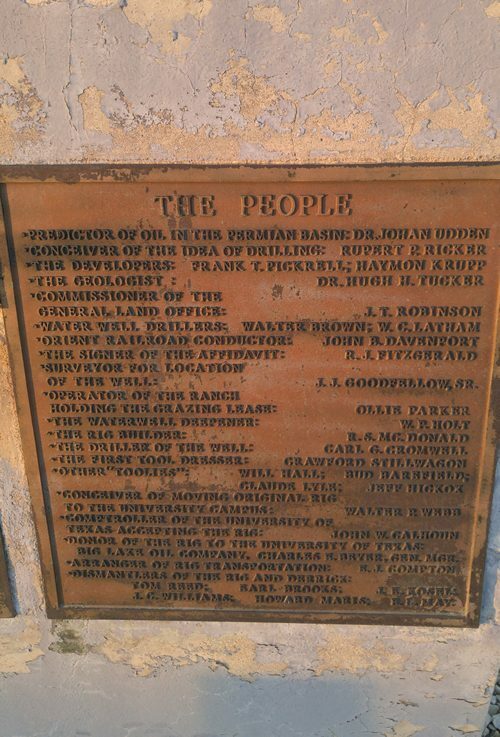 Given (1876) to the University of Texas, the lands around this marker were leased to cattlemen. The Kansas City, Mexico & Orient Railroad built its line here in 1911, but did little local hauling. 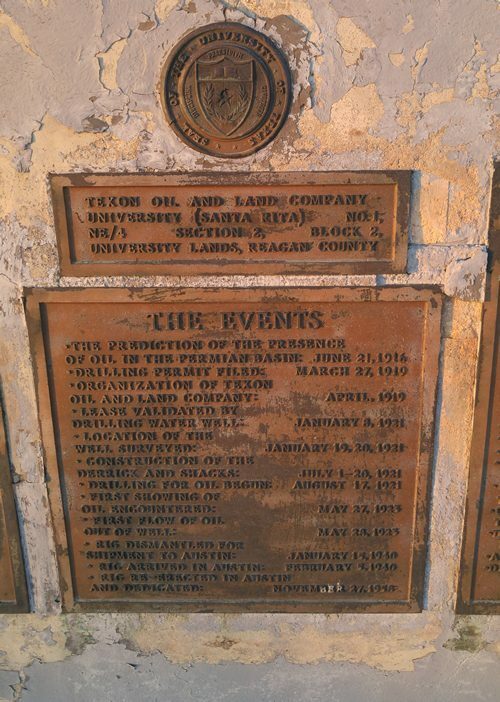 Development came after Frank Pickrell and Haymon Krupp of Texon Oil and Land Company drilled for oil. 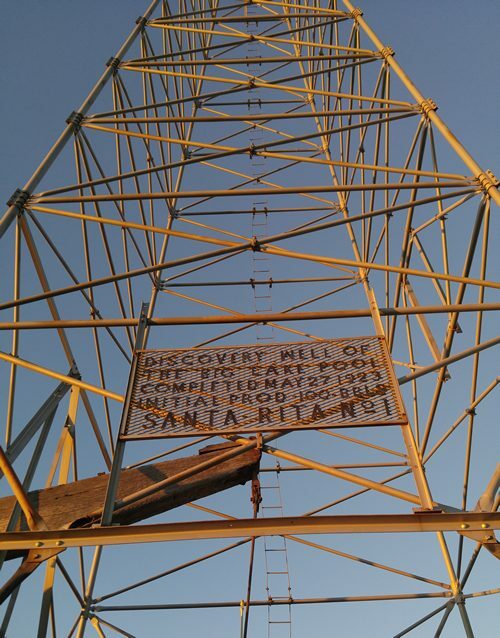 Their driller, Carl Cromwell, brought in Santa Rita No. 1, the first gusher in the Permian Basin, on May 28, 1923. Texon, first company town in the Permian Basin, was founded in 1924 by Big Lake Oil Company. Levi Smith, president of the firm, planned and supervised building of the town, and Ted Williams served as city manager for the company. Texon had stores, shops, a school, a physician, a dentist, a hospital, a theater, a park, a well-known baseball team, and many facilities for recreation. 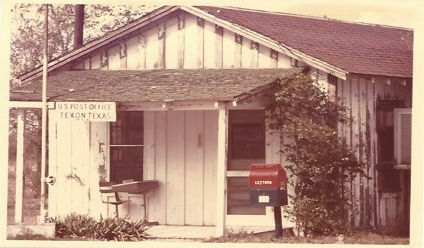 The post office opened in 1926. As many as 2,000 people lived here -- boosters claimed up to 10,000 -- manning the drilling, a gasoline plant, an oil treating plant, and other operations. Plymouth Oil Company absorbed Big Lake Oil Company, then sold out to Marathon Oil Company. The company town was closed in 1962. 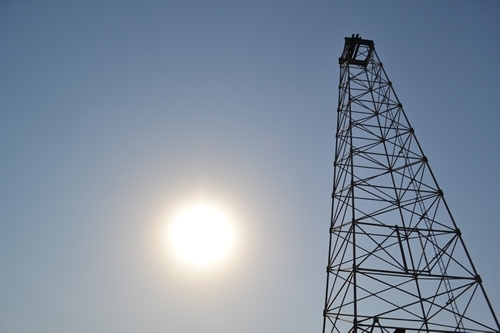 Discovery well for Big Lake oil field. 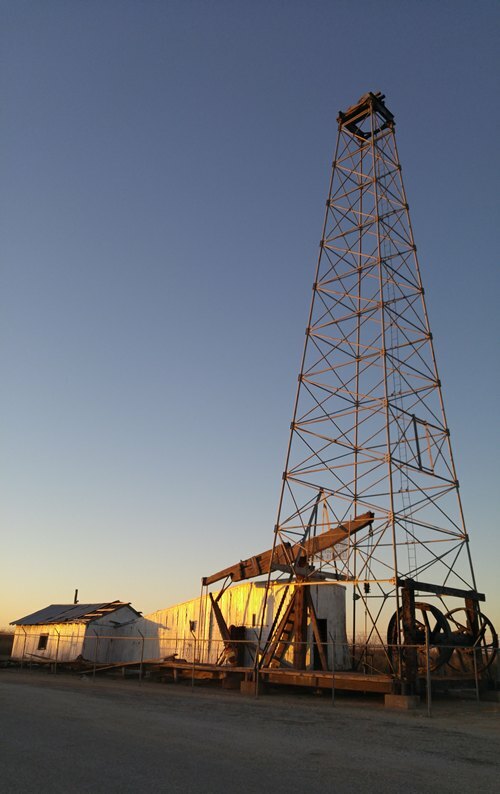 First gusher in Permian Basin; first University of Texas producer. On land once thought almost worthless. Fruit of the faith of Big Lake lawyer Rupert Ricker. 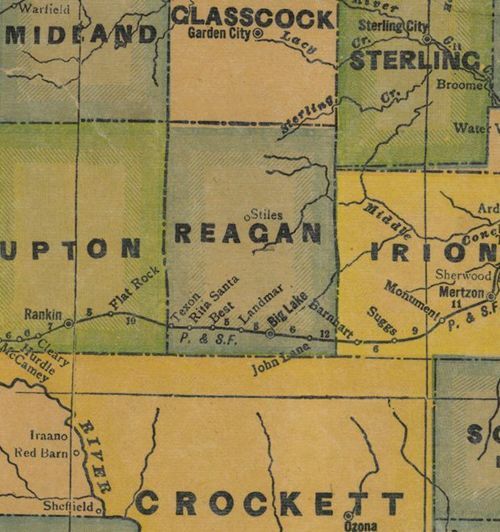 Though in 1919 no oil had been found within 100 miles, Ricker got leases on 431,360 acres of University of Texas land in Crockett, Irion, Reagan and Upton counties. Soon working with him were P. G. Stokes, Big Spring; Frank Pickrell and Haymon Krupp, El Paso; and others. 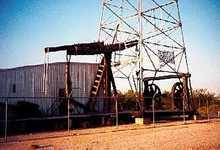 Their wildcat well, 1/2 mile south of this site, on Ollie Parker's Ranch, was drilled by Carl Cromwell. Dee Locklin was tool dresser. Slow and hard drilling made crew name well for Santa Rita, Patronness of the Impossible. 4 years, 2 months and a day after permit was filled, and at 3,055 feet, well pressure tossed the rig's bucket high into the air. Santa Rita was a producer, the date was May 28, 1923. 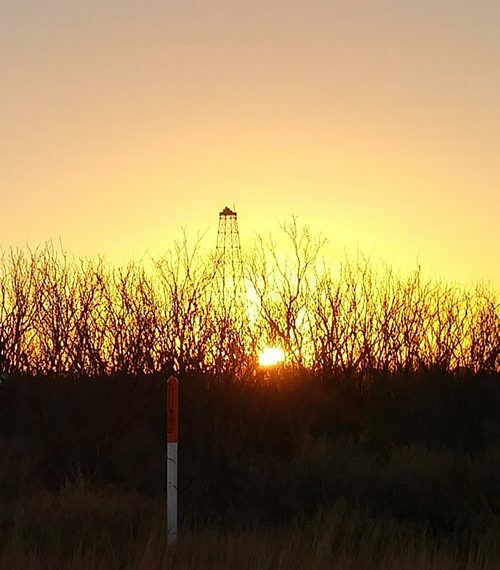 This day the Permian Basin, since acclaimed one of the greatest oil regions in the world, had its first big find. Other spectacular fields were to follow. Multi-millions in royalty dollars have since made the University of Texas one of the world's most heavily endowed schools. Original rig that brought in Santa Rita now is on the university campus. "The front half of the building was the Post Office." 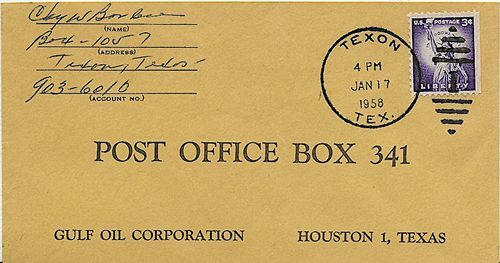 I was born in Texon, Texas in 1942. 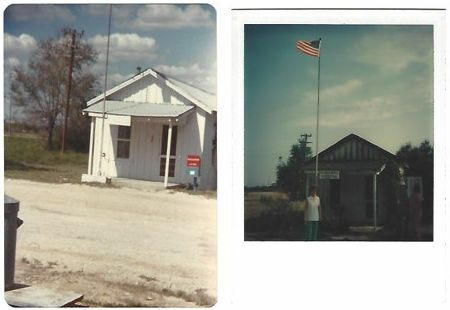 We lived there until 1957 when we moved to Iraan, Texas. We lived in two separate houses during that time including the old nurses quarters which was behind the hospital (which they moved away) where I was born. The town was a viable village with a cafe, drug store, grocery and dry goods store. The post office during my time was behind the drug store. We even had a beauty and barber shop. Our school went to the sixth grade with two grades in one room taught by the same teacher. After the sixth grade we went to Big Lake, Texas to school on a school bus. Everyone knew everyone and as a child I would wander around the town and every mother watched over for us.